The film rights to the British author Michelle Paver's book 'Wolf Brother' have been bought by Fox for £2.13m ($4m), for the director Ridley Scott to develop. Ridley Scott is quoted as being 'thrilled' with the project as, no doubt, is the author with the fee. The book is the first of a planned series of six under a general heading of 'The Chronicles of Ancient Darkness'. Published by Orion in 2004 it earned the author the highest advance ever made for a debut children's book at £2.8m ($5m). The film is due for release in 2006. The National Library of Scotland is to be given a top-up figure of £17.7m by the Heritage Lottery Fund to reach the £31.2m needed to acquire the unique John Murray publishing archive. Started by the first John Murray, a Scot who founded his publishing house in London in 1768, seven successive Murray generations built up the archive, one of the world's most significant literary collections made up of 150,000 manuscripts, papers and letters. It contains correspondence between the publisher and influential figures including Jane Austen, Charles Darwin, Sir Walter Scott, Benjamin Disraeli, David Livingstone, Thomas Carlyle, Sir Arthur Conan Doyle and Edith Wharton among others. It has been independently valued at £45m but has been offered for sale to NLS at a reduced price of £31.2m to keep the collection in the United Kingdom. The house where poet Ted Hughes was born at 1 Aspinall Street, Mytholmroyd, Hebden, West Yorkshire, a three-bedroom stone-built property, is on the market with an asking price is £145,000. Ownership of the domain www.tedhughes.org is included in the sale. He spent the first seven years of his life here, before his family moved to Mexborough. These formative years had a major influence on his later poetry with many poems written about the house itself as well as the nearby village, canal, river and surrounding moorland and woods. At least 28 poems are set in and around the house, with many many more about the Calder Valley beyond. Interest in Ted Hughes has grown steadily since the poet's death in 1998 and the land surrounding it is now a conservation area thanks to its links with the poet. Meanwhile, the former railway station at the heart of the village is to become the Ted Hughes Literary Centre in 2006. How many of the millions of readers of the best-selling Queen of Crime know that she had a secret double life as the novelist Mary Westmacott? According to her daughter, Rosalind Hicks, she chose the name after some thought - Mary was her second name and Westmacott was the name of some distant relatives. For 15 years from 1930 she managed to keep her second identity secret, and was delighted at the modest success of the six books she wrote under that name. In 1930 she felt she needed to write a book which was not a detective story, so ‘with rather a guilty feeling' she enjoyed herself writing Giant’s Bread, a novel about a man obsessed with music, which drew on her own experiences training as a singer and concert pianist in Paris. Her publishers, Collins, were not very enthusiastic. They wanted her to keep to detective stories, for which she was just becoming famous - she had published the first ‘Miss Marple’ story Murder at the Vicarage that year. However, Giant’s Bread received good reviews and sold reasonably well for a supposed ‘first novel’. Four years later, after several Poirot stories, she published Unfinished Portrait, which also draws on her own early life. Ten years later, in 1944, she published Absent In The Spring, the story of a self-satisfied woman who misses her train connection on the way back from Baghdad and has to spend several days alone in a desert rest-house, gradually confronting the reality of her relationship with her husband and children. As Agatha said in An Autobiography ‘ I wrote the one book that has satisfied me completely…. the book that I had always wanted to write….I wrote that book in three days flat….I don’t know myself of course what it is really like. ..But it was written with integrity, with sincerity, it was written as I meant to write it, and that is the proudest joy an author can have’. In 1947 she wrote The Rose And The Yew Tree, which was also one of her favourites. It is set in Cornwall at the time of the General Election in 1945, and as well as being a well constructed and very readable story it gives an insight into the political and social history of that period, when the war was ending and a new world was being created. Collins had been very lukewarm about publishing her ‘Mary Westmacott’ books, so for this book, and the two later books, A Daughter’s A Daughter of 1952 and The Burden of 1956 she moved to Heinemann. Collins, however, later realised their mistake and reprinted all six ‘Mary Westmacott’ books in 1985. Mary Westmacott never had the same popular success or critical acclaim as Agatha Christie, but the books are well written, compulsive reading and give a fascinating picture of life in that period. They are ‘romantic novels’ with a difference (they certainly have no happy endings) which deserve to be better known today. A new, special exhibition 'Currer Bell' is dead! is being held to commemorate the 150th anniversary of Charlotte Brontë's death from 1st February until 31st December 2005 at the Brontë Parsonage Museum, Haworth. This year sees several events to commemorate the anniversary as well as a normal programme and full details for the first part of the year are available on the Brontë Parsonage Museum and Brontë Society website. This year's £10,000 T. S. Eliot Poetry Prize, awarded by the Poetry Book Society and sponsored by 'five', has been won by Hungarian born poet George Szirtes, who was last year's Chairman of the judging panel, for his collection called 'Reel'. This year's Chairman of the judges, Douglas Dunn, said: "George Szirtes' Reel is a brilliantly virtuosic collection of deeply felt poems concerned with the personal impact of the dislocations and betrayals of history. The judges were impressed by the unusual degree of formal pressure exerted by Szirtes on his themes of memory and the impossibility of forgetting." The presentation was made by T. S. Eliot's widow Valerie at an award ceremony held at Senate House in London. Previous winners include Ted Hughes, Don Paterson and Alice Oswald. The £25,000 prize for the overall winner of the 'Whitbread Book of the Year' for 2004 has been awarded to Andrea Levy for her novel 'Small Island', which won the 'Orange' prize for her in June 2004. The Whitbread Book Awards, established by Whitbread in 1971, have the single aim of celebrating the most enjoyable books of the last year by writers based in the UK and Ireland. £1.7m has been raised to prevent the export of a medieaval psalter, unearthed when a family dispute forced the Earl of Macclesfield to auction off the contents of a library at Shirburn Castle. 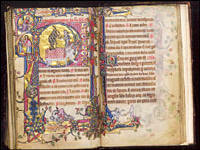 The psalter was bought at auction in June 2004 by the Paul Getty Museum of Los Angeles but has been subject of a temporary export ban pending the outcome of an appeal for funds to keep it in this country. The 225-page illuminated 14th Century work, previously unknown to scholars, is considered one of the most important of its kind. The 170x108mm illuminated manuscript was produced in East Anglia, probably at a priory at Gorleston in Norfolk, and its new home will be Cambridge's Fitzwilliam Museum.